Is Intel Building the World's First 450mm/10nm Fab? Intel is starting construction of the world’s first 450mm manufacturing facility that could be ready for production in 2015. That’s a fact. 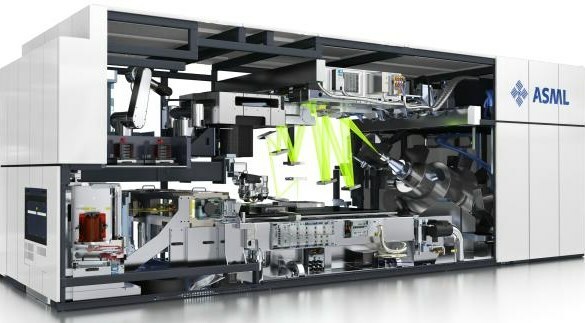 ASML says they will have production-ready 10nm-capable Extreme UV equipment in 2015. That is also a fact. Is Intel building the first 450mm wafer capable and 10nm node fab at the same time? Website Xbit Labs reports that construction of poetically named D1X Module 2 fab has begun this summer. Intel is going to throw some pocket money in it this year, at a height of $2 billion. The new module built in Hillsboro, Oregon, will have a floor area of roughly 1.1 million square feet (106 thousand square meters). It is about the same size as its twin, module 1, which is getting ready to start production of 14nm chips on 300mm wafers. The company claims the new module will be the world’s first facility capable of manufacturing semiconductors on 450mm wafers, departing from current 300mm wafers. 450mm wafers offer 225% the surface area of 300mm wafers used to fabricate almost all semiconductor chips on the market today. The size of the wafer is an undisputed advantage in the world of semiconductors manufacturing, substantially reducing per-chip costs. At the same time as Intel’s announcement, ASML, the world’s largest supplier of photo-lithographic equipment, has said that it will have production-ready equipment for 10nm process by 2015. According to Ars Technica, The company is currently working on a prototype photo-lithographic machine using high-powered lasers to etch 10nm features on silicon wafers. The new technology relies on Extreme UV (EUV) light that has a wavelength of 13.5nm, moving from the current use of UV light of a wavelength of 193nm. 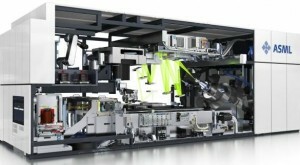 Producing EUV light is the main challenge in developing the new equipment. The company says its current NXE3100 prototype is able to produce about 55W of EUV light, but that commercial equipment will need to output at least 250W. The development of such hardware has been slow, a consequence of the challenge that is producing sufficient quantities of EUV light. 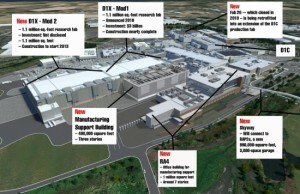 At some point ASML expected to have 80W prototypes by the end of 2011. Intel has mentioned that it needs 1kW light sources for its production equipment. Intel is starting the construction of the building for its new fab this year, a process that could take up to two years. 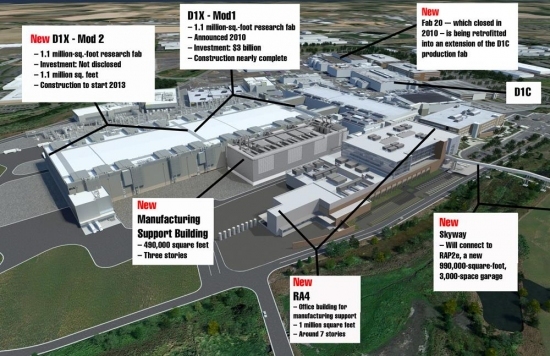 Following the latest announcement by ASML, we are left wondering what could happen if the company’s new EUV equipment was to be ready to outfit Intel’s new fab in the 2015 timeframe. Would Intel be owners of the world’s most advanced manufacturing facility, both on wafer size and process node? Executing the world’s most advanced manufacturing process on a wafer 225% larger than any other fab is capable of would give Intel a definite advantage in the foundry business; decreasing per-chip costs by using larger wafers while increasing performance and lowering power needs of its chips by means of a super advanced 10nm process. 10nm means more transistors packed on a chip, which means faster chips? Where does the decreased cost come in? More transistors on one chip = even higher temps than Haswell? 10nm node means lower power consumption per transistor. You usually want to keep this as low as possible while performing well enough. That's why it is quite common to see slow increase or even sometimes decrease in transistor counts. I would rather see Intel go for pillars/nanoimprint or even DSA instead of EUV for the next node since those technologies don't require major modifications on tools. Intel's new 450mm fab will most probably be 10nm-capable or smaller when it starts production in 2015/2016 time frame. What is unsure is if ASML will have Extreme UV equipement by then. If not, Intel will have to adapt current methods (double patterning with standard UV lights) for its move to 10nm with quadruple patterning/multiple exposures. This could extend current manufacturing methods and equipments for a couple more years but the move to shorter wavelengths will have to happen sooner or later. 10nm is possibly the last process node that could be manufactured using standard 193nm UV light. The move to 450mm is a huge investment at first but will, over time, give a massive advantage to Intel in the world of foundries. Other players will have to follow if they want to stay competitive. Smaller transistors can often switch faster, but not always. They don't directly increase performance. What they do increase is how many transistors can be packed onto a given size slab of silicon. More transistors to play with = better clock/clock performance. looks like Intel is still the king of fab and plans to be for the foreseeable future. Translation: Intel is a drag queen. Lol exactly cheaper manufacturing for intel just means they will make more $ off us when they force us to pay the exact same prices down the road due to AMD atm not offering anything near them in performance - efficiency - or low wattage. More transistors to play with = better clock/clock performance. So this is why Intel will keep beating AMD? Their transistor density is better? I always get confused when it comes to AMD vs Intel, Intel has lower clocks but better efficiency because there are more transistors in their cores than AMD? This must be where I've heard people say "AMD cores are not real cores"
Intel spends more money / man hours on R&D. Money / man hours = results. It is said it costs $300-400 million to develop a new CPU architecture from the ground up. Intel has tons of money to invest in development, AMD sold their HQ a few months back. So yeah... Intel has better CPUs. I think it would be interesting to see what AMD could do with if they could manufacture at the same transistor size as Intel. But that won't ever happen. But that won't ever happen. According to quantum mechanics, it's already happening in a parallel universe. Intel says 10nm is on-track for production in 2015.